Congratulations on purchasing your first home or maintaining your current home! It must be time for you to secure suitable Florida homeowners insurance to protect your investment. If you are looking for Florida homeowners insurance quotes perfect for your needs, then you've come to the right place. We protect Floridians. Before we get your quote for you, here are the basics of Florida homeowners insurance. The following are sections of what will be contained in your new policy. coverage for home contents such as furniture, jewelry, electronics etc. These areas of a policy will dictate the overall Florida homeowners insurance rates that you will receive. An insurance company assesses each area of the policy and creates the final cost of coverage. You wouldn't want to pay for coverage that isn't completely necessary to protect you in the event of a loss. To know what is essential to be included in your Florida homeowners insurance policy, you should talk one of our agents. Here are our quote request questions. Fill this out and we'll get to work for you. Requesting Florida homeowners insurance quotes from us will help you a lot when it comes to finding the best Florida homeowners insurance rates. We offer 37 companies and all our companies are A rated. Furthermore, we have excellent customer service. There are a lot of home insurance companies in Florida that you can choose from, and when there is a lot of competition out there, the prices are also more competitive. We know you can look anywhere for your Florida homeowners insurance quotes. In fact, this is the fastest way to get the information that you need in relation to Florida homeowners insurance. We give you multiple company choices so you get the right policy for your needs. By doing this you will also get the best value for your money. Do not hesitate to spend some money when it comes to the protection of your home. Have it protected against hurricane, fire, floods and other perils. Most homeowners are finding out the hard way that insurance is very vital once you are a homeowner. You do not want to lose your home and all of your hard earned investment due to natural disasters. 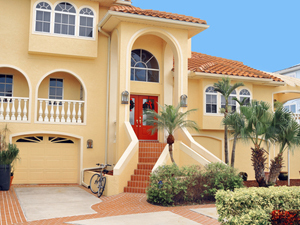 Best to protect your home with a credible Florida homeowners insurance quotes. Call us today at 352-200-2066 to discuss your options, or fill out the quote request form above so we can deliver your quotes immediately. This is a site that is secure, and one that you can entrust your information to. We don't share your information with any other party.